I believe it was the slam of a large piece of plywood falling 2 some-odd stories onto other lumber that rudely awoke me at 7:40 AM this Thanksgiving morning.Â An no, I couldn’t go back to sleep as the hum of a noisy air compressor placed precisely next to the property line driving the pneumatic hammers were equally annoying. That was the scene at my home this holiday. 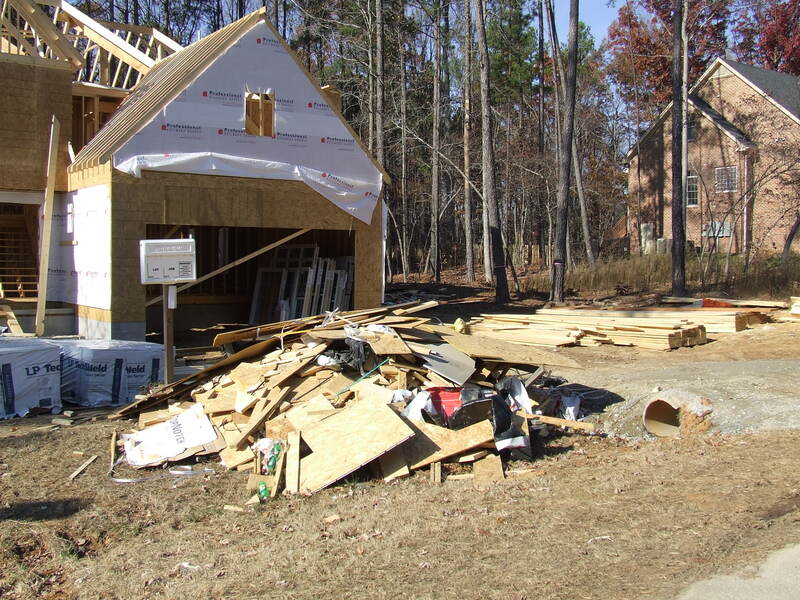 D&G Builders of Fuquay Varina proceeded to work on a new house. 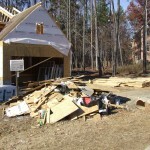 A house next door being constructed on behalf of PenfieldHomes.com. So after telling said project manger that I didn’t want a feud, I apologized if anything we said or did offended (though I’m truly hard pressed to think of any such word or deed) – and he in turn called off the work squad – and I began to think of how similar situations can impact the peaceful operation of our church and charity websites. I had an experience lately where some blogs I run on a shared server were inaccessible due to the incoming noise from a bunch of spammers and ‘bots. This was because a neighboring domain sharing the same IP had put up a BBS in an unsecured fashion. It’s only happened once, but a truck was recently parked that partially blocked our driveway. In the same way, access to your site can be obstructed in part and/or in whole when those working on and/ror running the website ‘next door’ with an improperly parked modules and/or run-away program that consumes all the server’s memory and ports. Nobody like’s picking up someone else’s garbage. My wife is no exception, as she recently found herself picking up unsecured McDonald’s bags that had blown into our yard. In the same way, neighboring website projects can also leave rubbish in the form of temporary files, no-longer used compiler settings and the like. The Wake County, NC ‘UDO‘Â defines a minimum number of feet in which a new home structure can be built next to another, how much noise is acceptable and other fun stuff like that. However, just because these rules are on the books doesn’t mean they’re going to be enforced. Meaning, it is going to be up to me to look out for instances of encroachment. In the same way, don’t expect or assume the host of your shared server is going to have your best interest in mind. They don’t and won’t. It is up to you to be diligent be on guard for those times neighboring websites and/or webmasters wander into your domain – and to work within the boundaries of good citizenship and the rules to resolve such issues. If possible, establish one point of contact and a protocol for those situations where you feel you’re on the receiving end of some inconsiderate instances or situations. For example, know the correct channels of communications for your web host, and if feasible, for your IP Neighbor. Similarly, understand that email, though convenient, can lead to a breakdown that leads to unnecessary and unfortunate bad blood. Especially true when individuals on the other side are already having a bad day due to some other unrelated inconsideration. In all cases, keep track and logs of all such communiquÃ©s as you never know when you’ll need them. Anyway, those are my thoughts this Thanksgiving morning as I ignore the slam of pneumatic hammer guns and the humming whir of the air compressor and set my thoughts onto some delicious Greek Chopped Meat Stuffing and football. Well that and all the wonderful ways in which I’ve been blessed, including my family, my friends, my job, my church, and also the hundreds of visitors to this site – many of whom have sent me private messages of best wishes. Thank you all. I’m very grateful for every remembrance of you (Philippians 1:3). Now if you don’t mind me, I’m off to E-Bay and/or Craigslist to find an affordable ANSI S1. 2-1962 sound level meter to leverage. I’m hoping I don’t need it but one never knows.